My “new” machine, this one is from the 1950s. We’ve been together about 6 years, and I love it. There are no computers to mess up and it’s not fussy, yet it is a workhorse and does all kinds of fun things. This machine gets almost daily use. I’m not sure how old this machine is, but it’s old. I’ve only had it for a few months, and we’re still working out the kinks in our relationship. When it works it is one of my favorite machines ever. When it doesn’t, lets just say no one really wants to be around me! I’m hoping we can work things out soon so I can enjoy it’s speed and beauty more frequently. This is my oldest machine, and the thing I would rescue in a fire (after my children of course, who are obviously much more important, and also not things!). 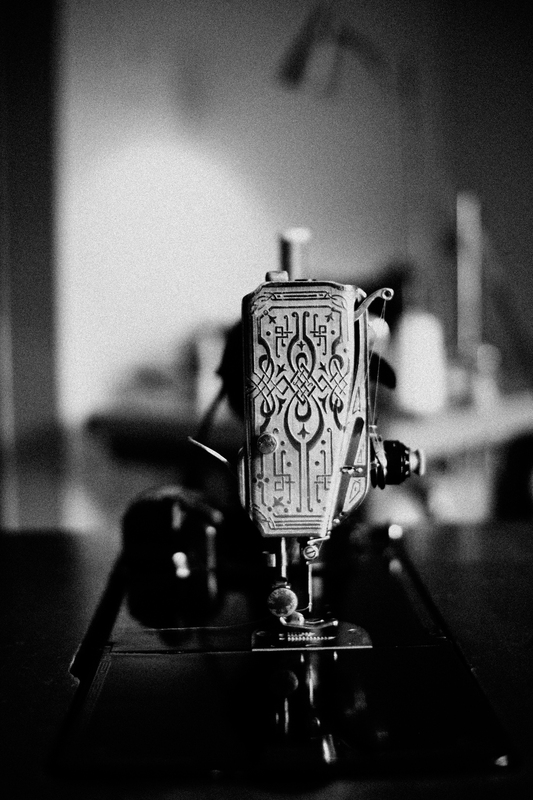 My great-grandmother’s machine, it was made in the 1930s and still sews like a dream. 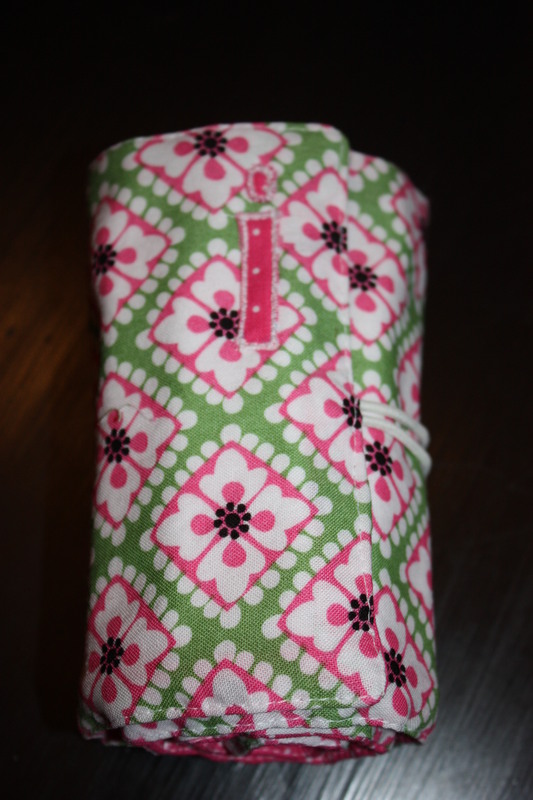 It is absolutely my favorite machine to sew on. 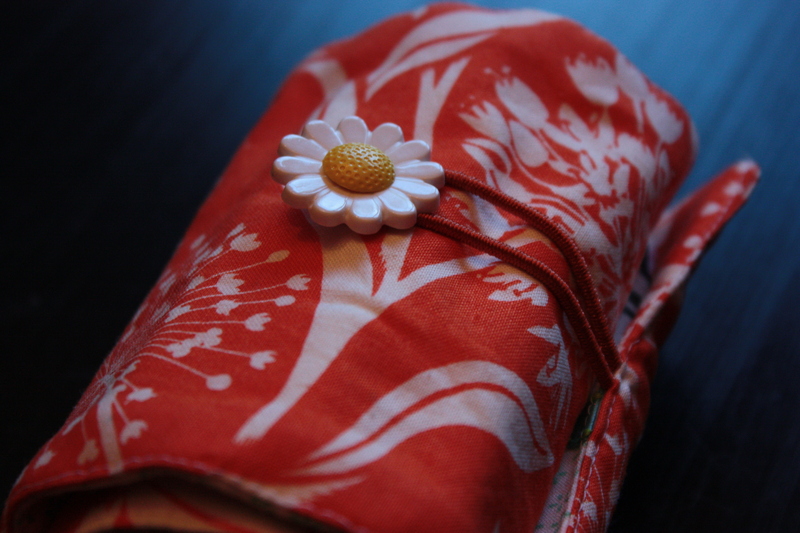 We’ve been together for over 20 years, and I am still as thankful for it as I was long ago when I first learned to sew on it. Some things are so beautiful they don’t need bells and whistles, and this machine definitely falls into that category. 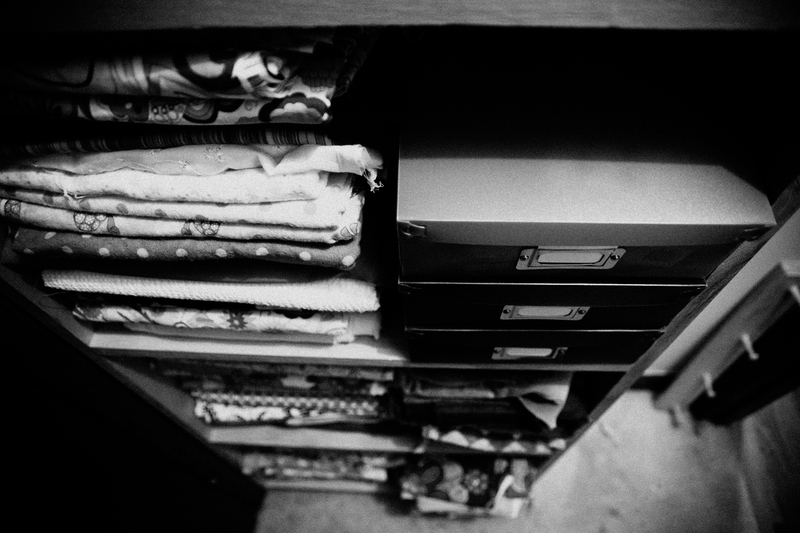 Every seamstress has a stash of fabric, right? 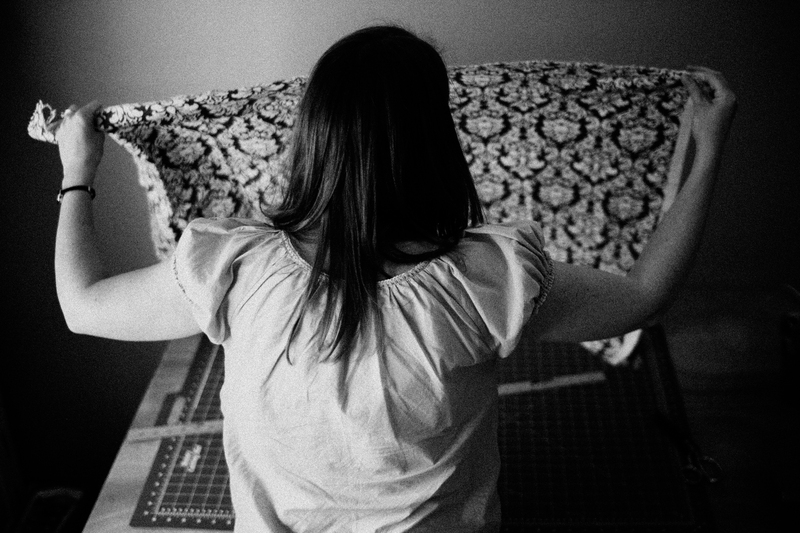 I once made the comment to a friend that one day I was just going to start collecting fabric I liked; she looked at me incredulously and said “you already do!” She was right of course, I just hadn’t thought about it that way, because in my mind everything I bought had a specific purpose. The only problem is sometimes I forget what the purpose is by the time I finally get around to working with a specific fabric. Or I change my mind. Or it’s not enough fabric. Or something else. 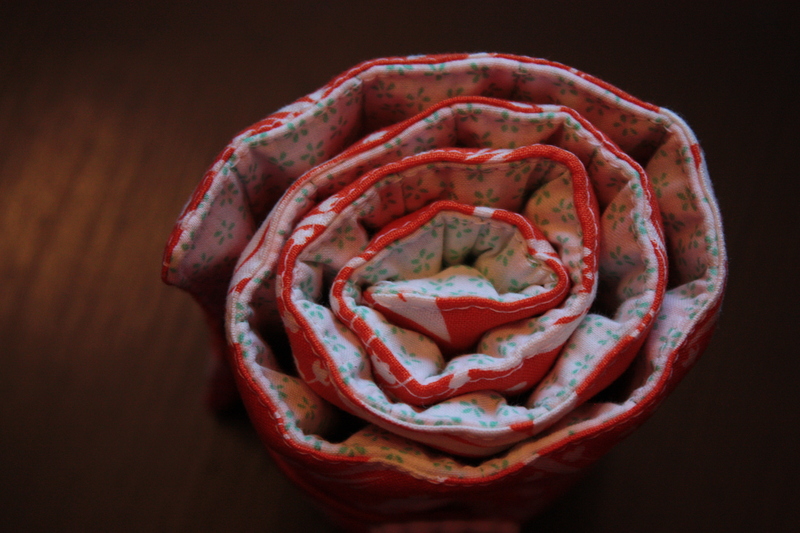 So now I have a lot of fabric, just waiting for a purpose. Too little to do much of anything but get into trouble, this guy is a good audience, jumping happily for about 10 minutes. Needless to say, most work is done when he’s sleeping. But isn’t he cute?! 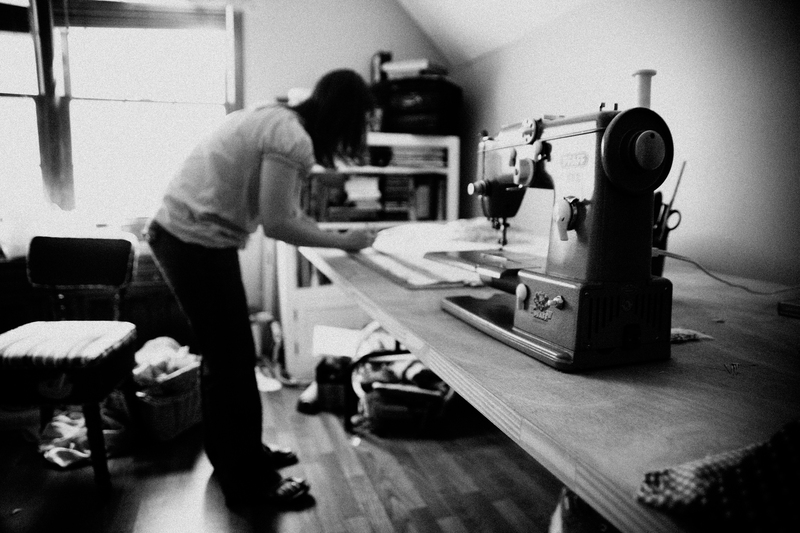 Spreading, measuring, cutting, sewing are all in a day’s work around here. These days hardly a day goes by that I’m not working on something – either for myself or someone else. That’s the way I like it – creating and bringing beauty to the world is part of my life’s work. 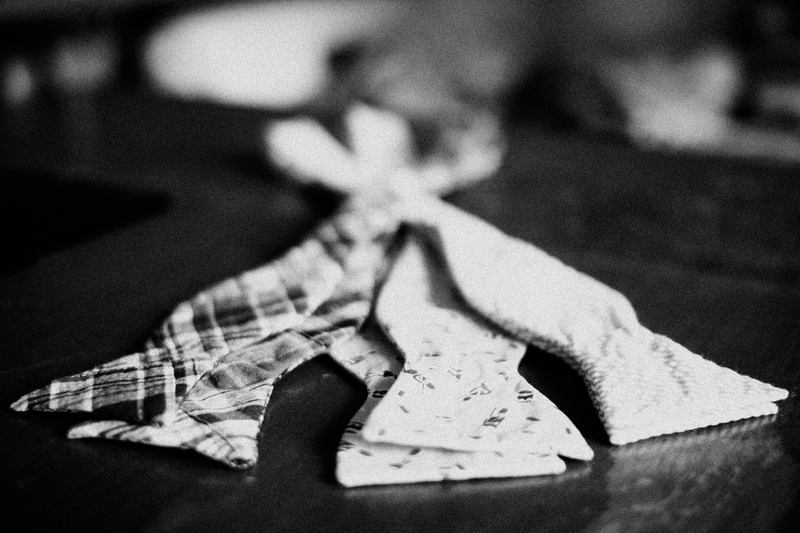 Just one of many things we make, bowties are fun and cheerful, and easy to piece together from left-over fabric. 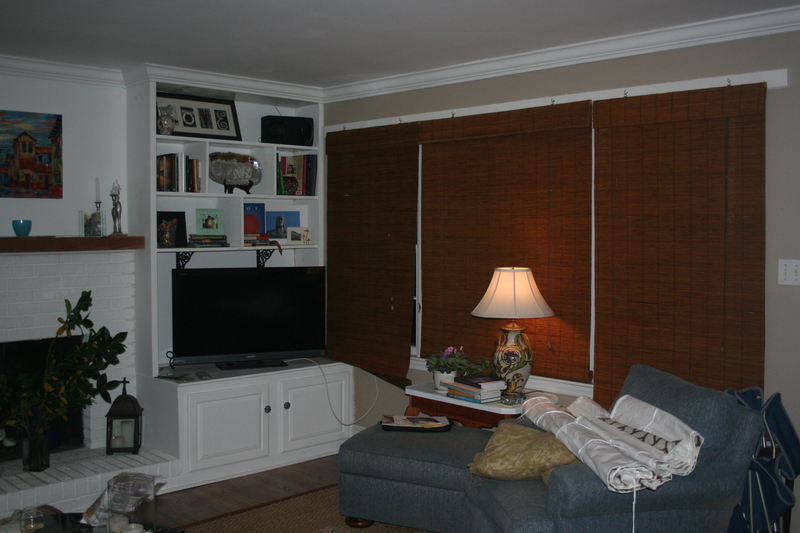 Somehow this was the only finished product here to be documented, but let me assure you, if pictures were taken today I would have pillows, curtains, dresses, and more. It’s busy around here! Our sweet girl always wants to help. She can “thread up” my machine for me perfectly, and she loves playing with fabric, yarn, and rick rack. 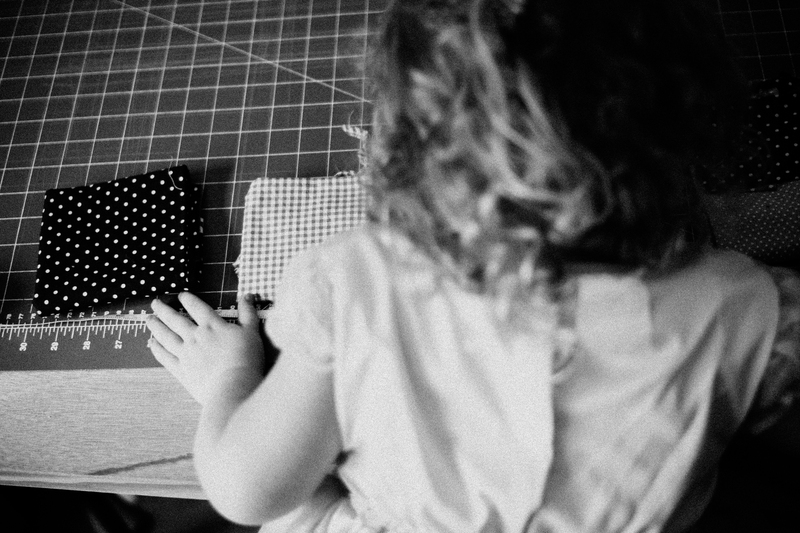 She’s a budding designer, already choosing fabric for her own clothes and projects, as well as offering opinions about other people’s projects. I love her, and most of the time enjoy her company in my sewing room (when my blindhemmer isn’t working properly is a notable exception). 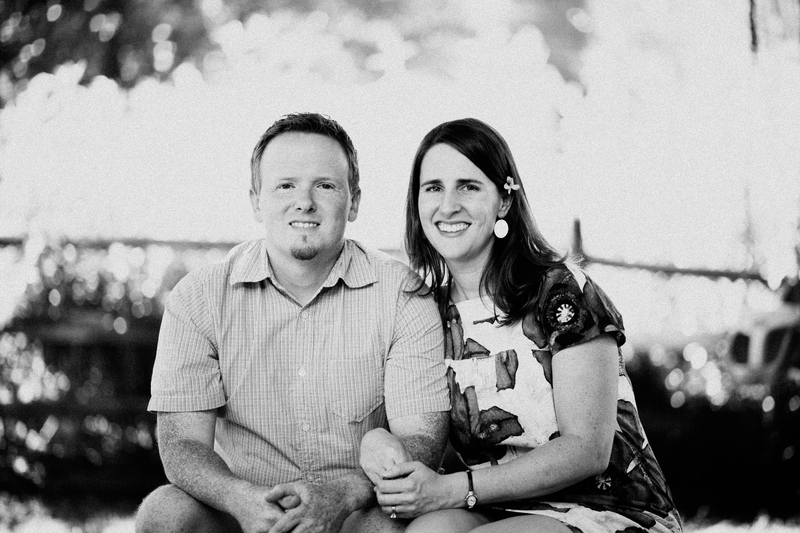 I saved the best for last: the man who has spent 12 years supporting me in my creative ventures. He doesn’t complain about my stash of unused fabric (you already saw that), my collection of machines, nor my insistence on giving over one whole room of our house to sewing. He installed a new floor in my sewing room several years ago so I could actually clean it, and he even cleans it for me when the strings start to cover the whole thing. He doesn’t complain about how much time I spend sewing, or even that I’m always roping him into helping somehow. This summer he helped without being asked as he took ownership of this business too and helped it grow. I couldn’t have done all I’ve done all these years without him, and patchwork21 wouldn’t be what it is today without his input – of time, energy, creativity, skill, and vision. Now that he is otherwise employed – doing what he loves and is passionate about (yay! 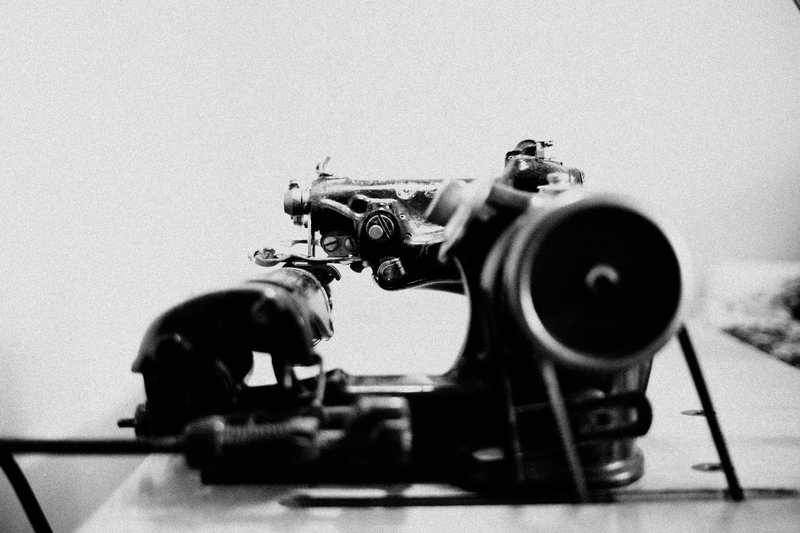 ), I’m back to sewing and running this business mostly by myself, but still not without his continued influence. Thanks to you, Nick! 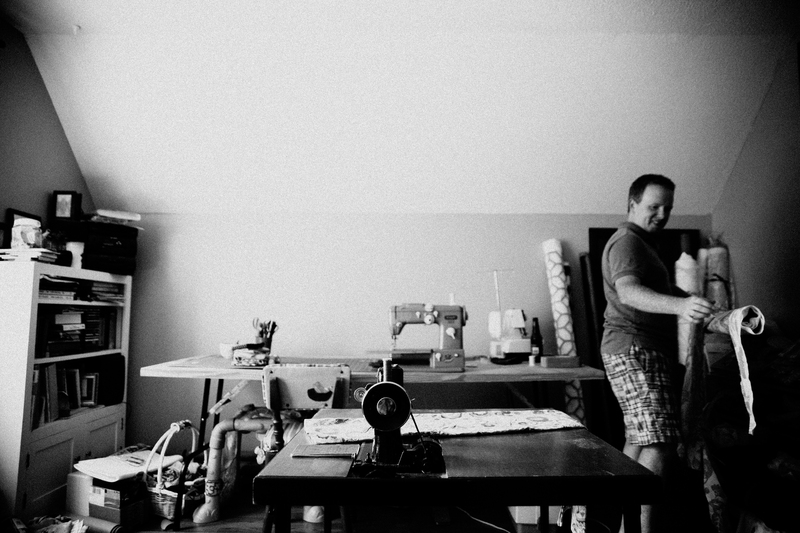 I’m a better woman, seamstress, designer, and business owner because of you (not to mention wife, mother, friend, pianist…). Hope you enjoyed! 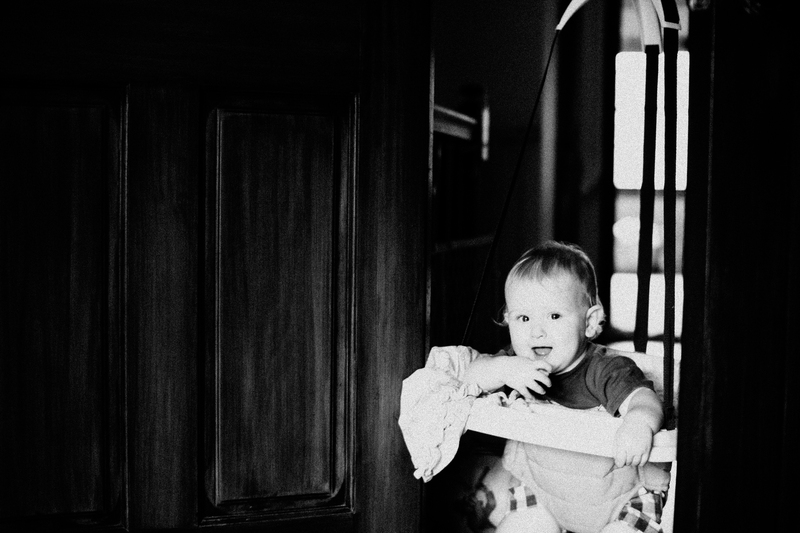 It’s probably obvious I love vintage things and the people in my world. 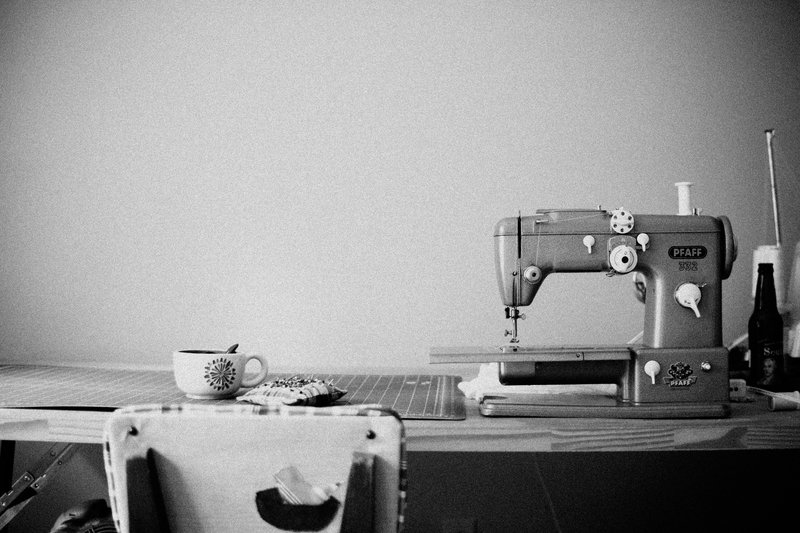 Sometimes things are crazy around here and I never want to see a sewing machine again, but usually we hum along just fine, taking fabric and turning it into something beautiful and fun. And I, for one, and glad to be doing my work at home, with my assistant, my audience, and my man; I’m glad we’re in this life together! 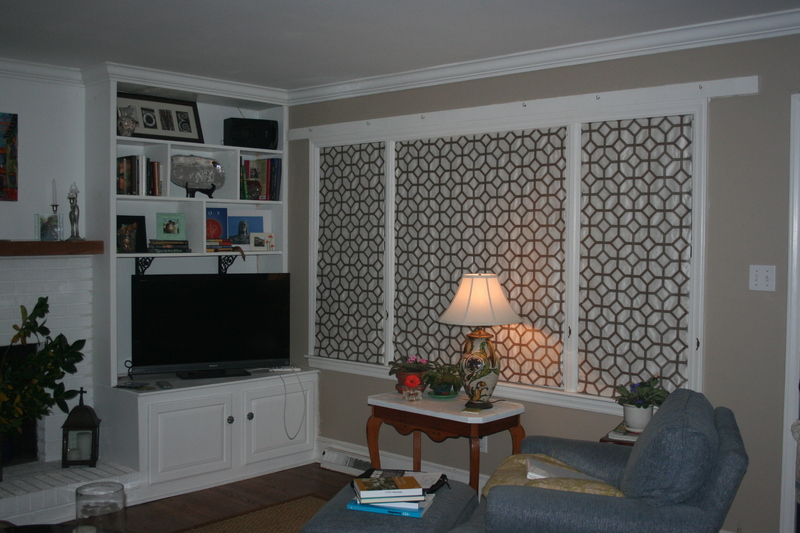 I finished these shades for a client not long ago and I love how they open and brighten the room! My daughter loves to color! Other than reading or playing outside there’s nothing she would rather do. 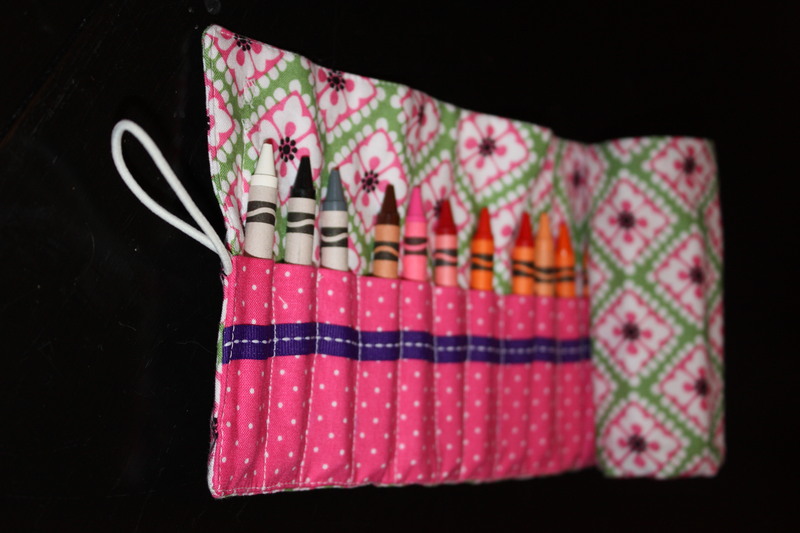 Since my husband lost his job, we’ve been doing a lot of traveling (because what else do you do when you don’t have a job to go to every day), and I’ve wanted an easy way to transport crayons and coloring books. 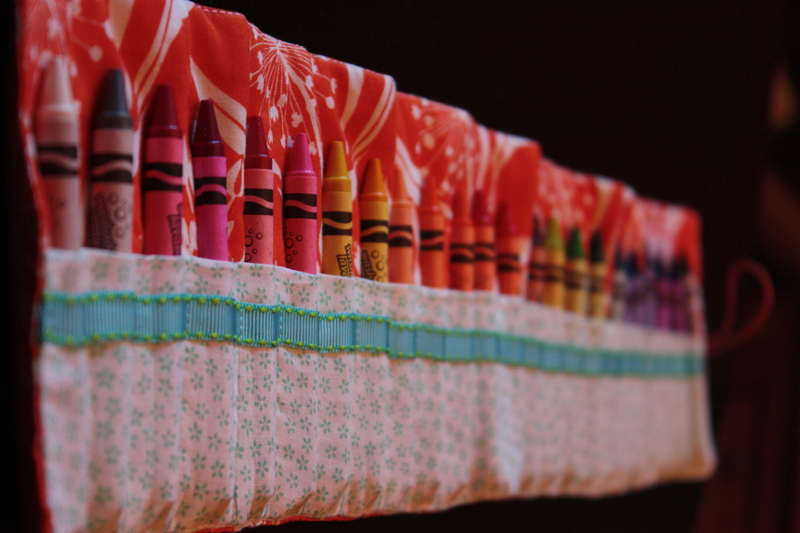 Enter the crayon roll! 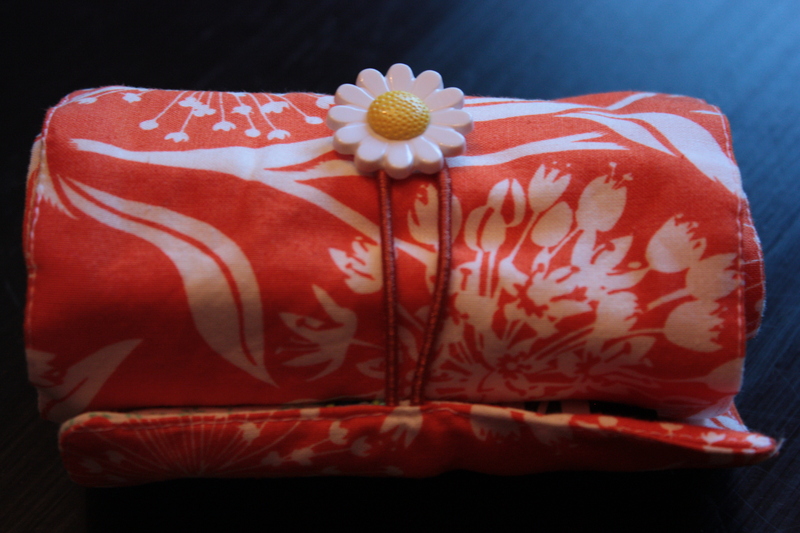 I rummaged through my fabric stash for some choices, and she chose this lovely orange print – her favorite color. For the inside I found a pretty vintage calico, handed down from a friend’s mother, and added the turquoise ribbon to make the color pop. I’ve seen these rolls made with ribbons to tie them closed, but I wanted something easy that I didn’t have to close every time she was finished coloring. With little ones, simplicity is key! 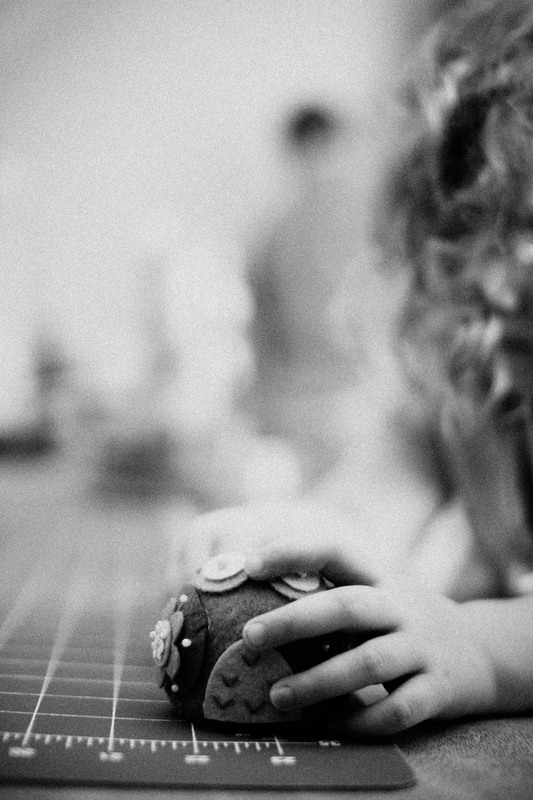 So instead I used a button and rubber band – easy to open, easy to close, and fun to look at on top of it all. Christmas gift, anyone? 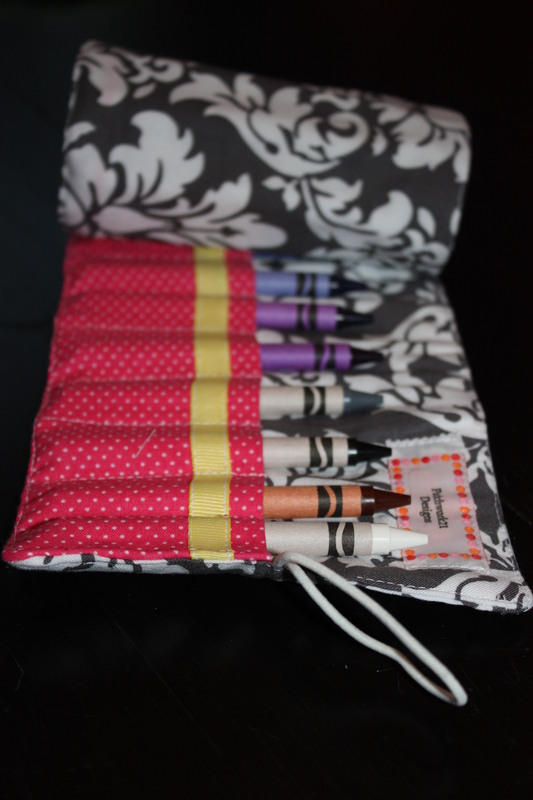 My crayon rolls sell for $16 each, including 24 crayons, or $14 without crayons (much easier to ship if needed). You pick the colors and boy or girl; I’ll pick the fabrics and put it all together. Next up: rolls to keep up with even more things – matchbox cars and other toys, and even makeup brushes. 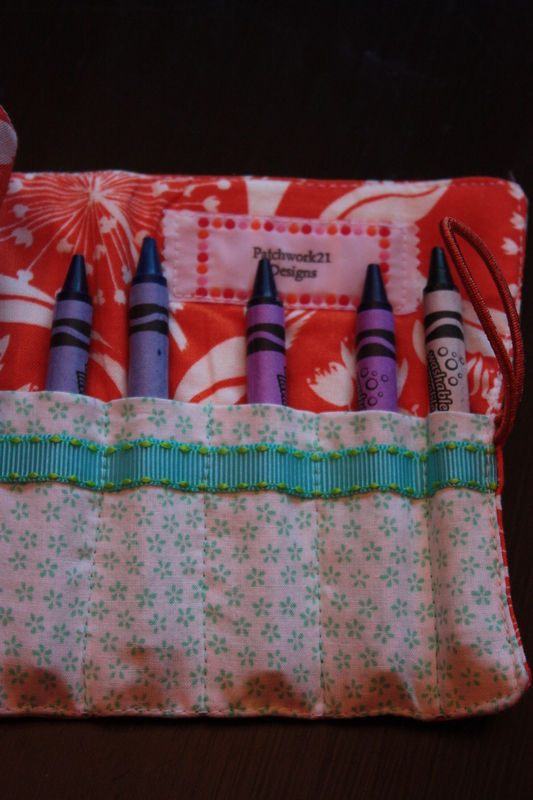 And a crayon roll that comes with a pad of paper, so you don’t even have to take along a coloring book! We made a lot of cushions this summer. In addition to the chair cushions we made (here), I made a new cushion cover for a neighbor’s bench seat, a big bench cushion for a friend, and a vinyl bench cushion. 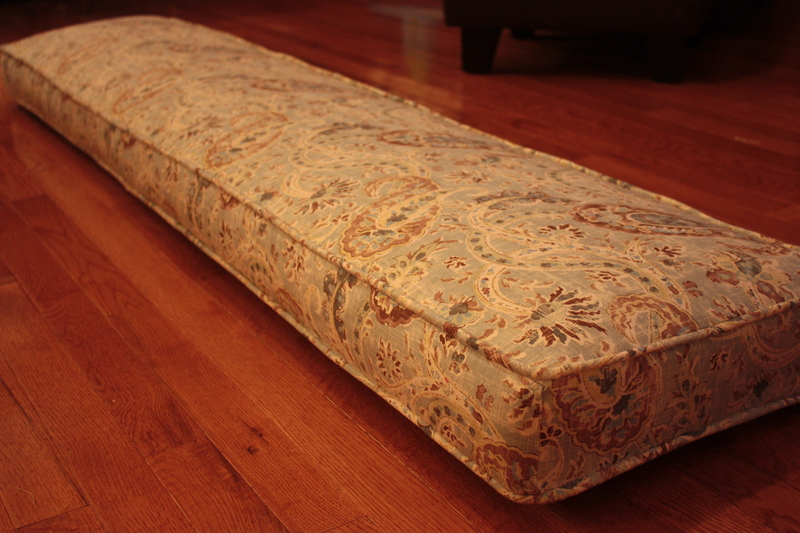 My friend has a fabulous old church pew and asked me to make a cushion to soften it. 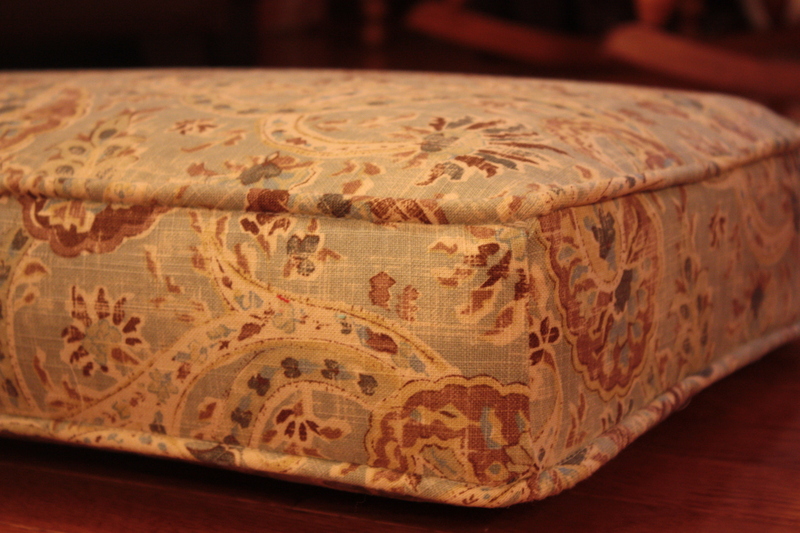 We used 3 inch foam wrapped in dacron, and covered it with this pretty paisley. 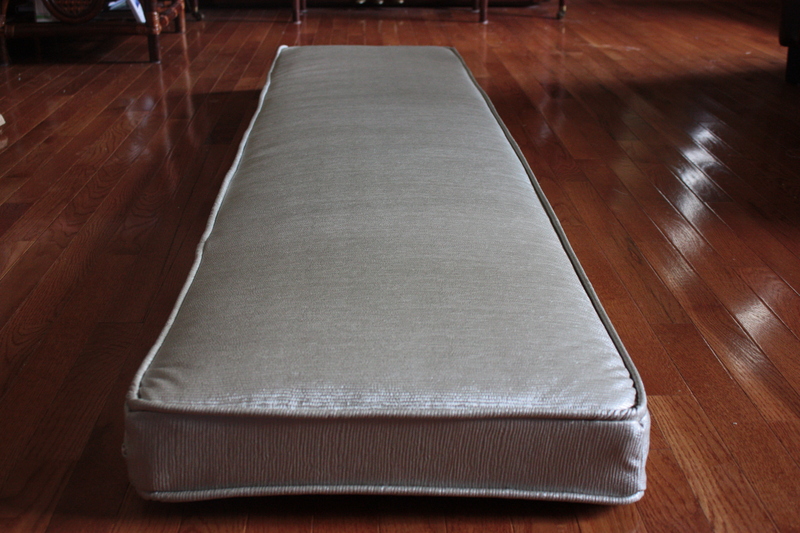 I am very pleased with how it turned out, and hope her family enjoys their new softer seating! 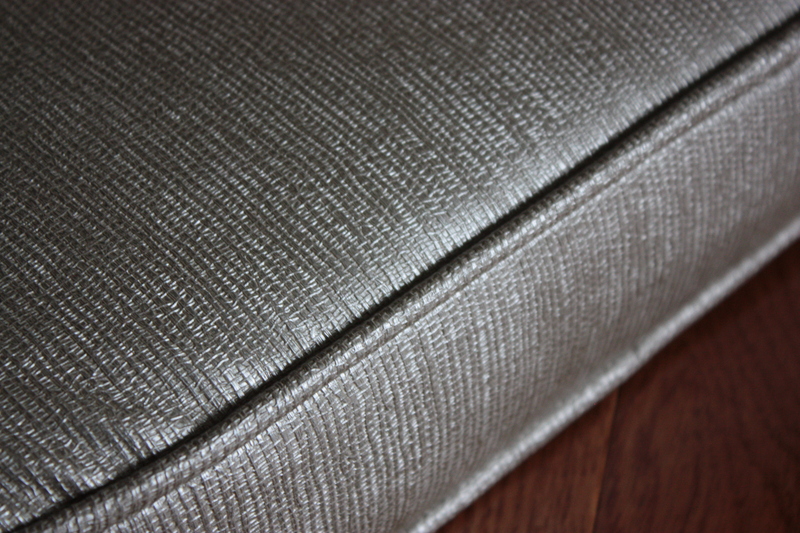 Prices for cushions start at $18/linear foot. A new customer asked me to make a vinyl cushion for her farmhouse bench. 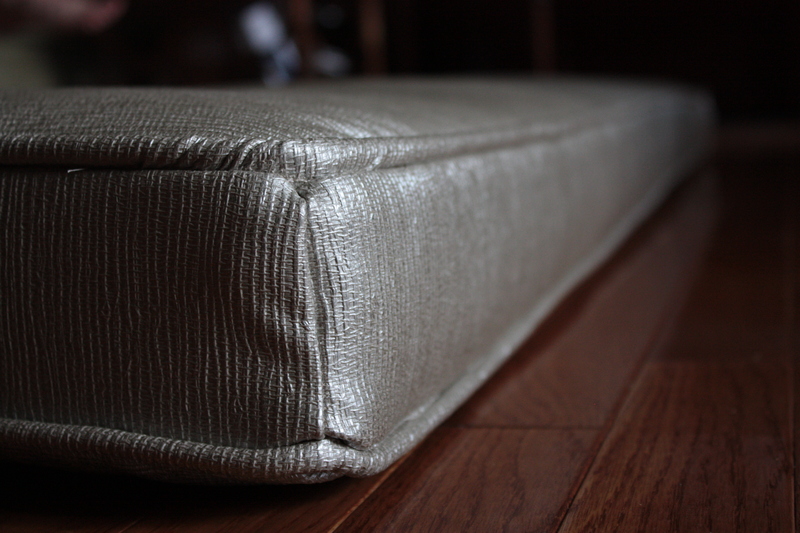 She needed something that would hold up to her kids, and picked some lovely silvery-gray vinyl from Modern Fabrics for the task. (If you live in Charlotte and haven’t checked out Modern Fabrics, you should – it’s a great store with a unique vision and selection!) Here’s the finished product.